This week, Charleston finally took its first step towards opening downtown to West Ashley bikers. 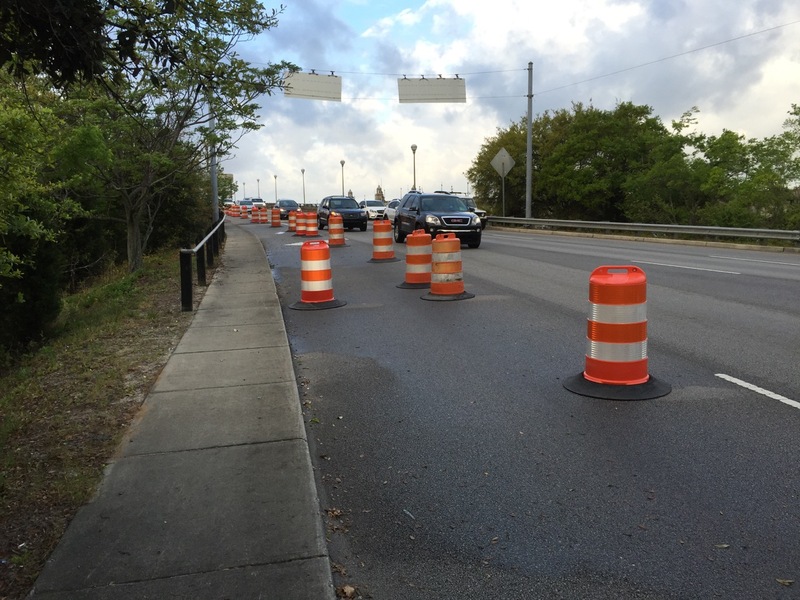 The Ashley River experiment consists of this: using barrels to block motor traffic from the far-right fourth lane of the in-bound bridge. When I took pictures on Thursday morning at 8:15, cars flowed unimpeded over the bridge. Of course we always knew that there would be no problem ON the bridge. If closing the fourth lane to cars will cause a problem, it’s most likely to be felt earlier, on the Folly Road approach, which has been reduced from two lanes to one. I didn’t ride past Folly to see how it looks in rush hour: I hope to get some pictures of that situation next week. On Day 1 of the experiment–Monday morning–the Post and Courier‘s Brad Nettles snapped this shot (I guess from the top of the Holiday Inn tower). It gives an approximation of how bikers will eventually use the lane to commute. Apparently, someone at DOT read their newspaper on Monday, because it wasn’t long before they set up several rows of barrels across the right lane. You’d have to carry your bike on your shoulder to get through them now. According to P&C reporter, Robert Behre, County officials thought the lane was just too dangerous. Cars could easily careen through those temporary barrels and hit a biker. Signs that mock us . . . This sign now greets bikers who approach the Ashley River from downtown. The DOT promises to fine anyone so bold as to use the empty lane. You’re allowed to ride your bike across the bridge in traffic. That’s perfectly legal. In fact, that’s the design of Charleston’s road system right now. It’s incredibly dangerous, as anyone who’s tried it knows. I did it once. I used up several years of good karma by the time I descended, shaken but alive, on the peninsula. I vowed never to try it again. But it was legal, while riding behind the barrels is so dangerous we have to fine people who try. Crazy. Don’t get me wrong. I don’t really care that we can’t ride bikes in that experimental lane for six weeks. It’s just that it typifies the craziness and exposes the down-right hazardous transportation system we have in place in Charleston today. Take the sidewalk running up to the bridge. Even before we installed the barrels, this sidewalk was a joke we pulled on tourists. We lure them with beautiful scenes of the marsh and marina. Come! the sidewalk croons: Take a stroll along the water. Every now and then you see a poor sap lollygagging up this sidewalk only to find an impassible bridge at its end. To rub it in, here’s the sign that mocks visitors when, disappointed, they turn around to slink back to the hotel. East Coast Greenway! That’s a 1900-mile bike route up and down the entire Atlantic seaboard. The broken link is our Ashley River. Unless you drop down from the sky at the foot of the Ashley River Bridge, you’d never even see this sign. Maine linked to Florida, if only we could get across that damned bridge! I’m exaggerating. The East Coast Greenway is partly aspirational. But here in Charleston we could complete a giant chunk of it if only we follow through with this lane. Till then, anyone who wants to cross the Ashley has to use the three-foot sidewalk on the far side of the out-bound bridge, almost half a mile away. The folks on the South Carolina committee for the East Coast Greenway recommend that only “adults and/or experienced cyclists and walkers” use this route. You know there’s something wrong with your infrastructure when the sidewalks are too dangerous for kids. So much for getting to West Ashley from downtown. What about going the other way? Bikers heading downtown can’t cross the river from most directions. The West Ashley Greenway peters out near the parking lot of California Dreaming. The sidewalk along Savanah Highway just disappears as the road approaches the bridge. Folly Road’s a non-starter. The only choice is Highway 61, which sports a generous bike lane. But that lane ends well short of the bridge and dumps bikers out into the right-turn-only lane exiting 61. If you succeed in crossing the path of those right-turning cars, you then have to cross Highway 61, braving the cars gunning their gas to leap out of Wesley Drive into the fast-moving traffic of the highway. Cars are supposed to yield to people in these cross walks, but they don’t. Just about every day, drivers will almost run me down when I’m in the cross walk, and then they’ll sneer at me as if they have the right of way. Wesley and 61 is the most dangerous intersection I encounter anywhere in Charleston. 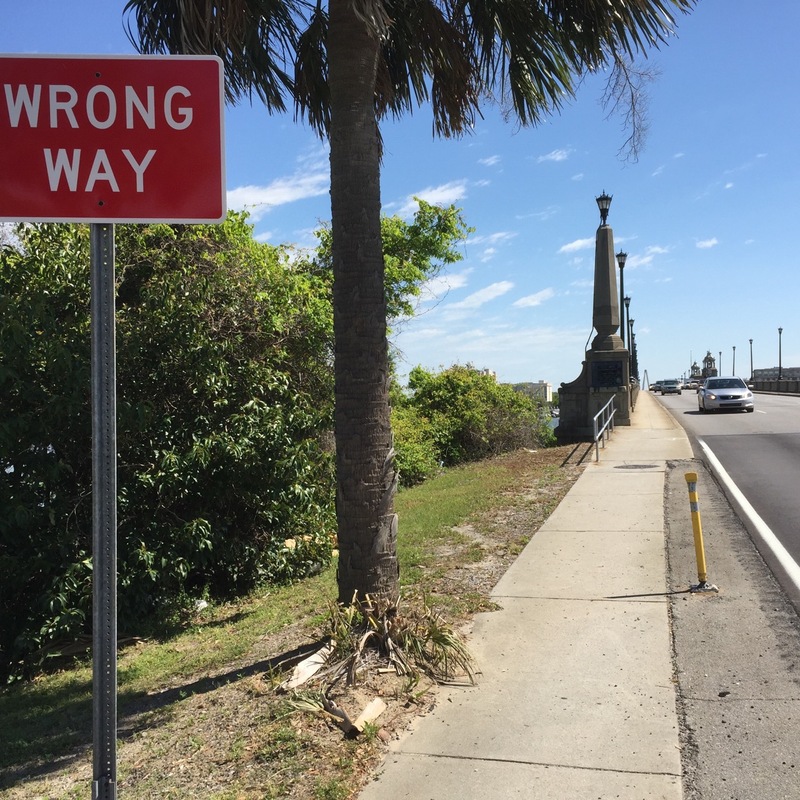 This sign says it all: the out-bound bridge is the wrong way to cross the Ashley into town. Next bikers have to navigate a narrow sidewalk that eventually leads into town on the out-bound bridge. As you can see from the picture at the left, skinny yellow plastic posts are all that protect them from cars, but the DOT fines no one for using this sidewalk: it’s how our transportation system designs them to get over the river. Forget about cars. Mixing bikers and pedestrians on that sidewalk is a terrible idea, as both walkers and bikers will attest. There’s just not enough room. You have to get off your bike and shimmy past anyone you encounter coming the other way. The whole problem’s summed up by this sign–WRONG WAY–put up by another irony-monger at the DOT? Finally, adding insult to near injury, the commuter finds this little hazard on the other side of the river. 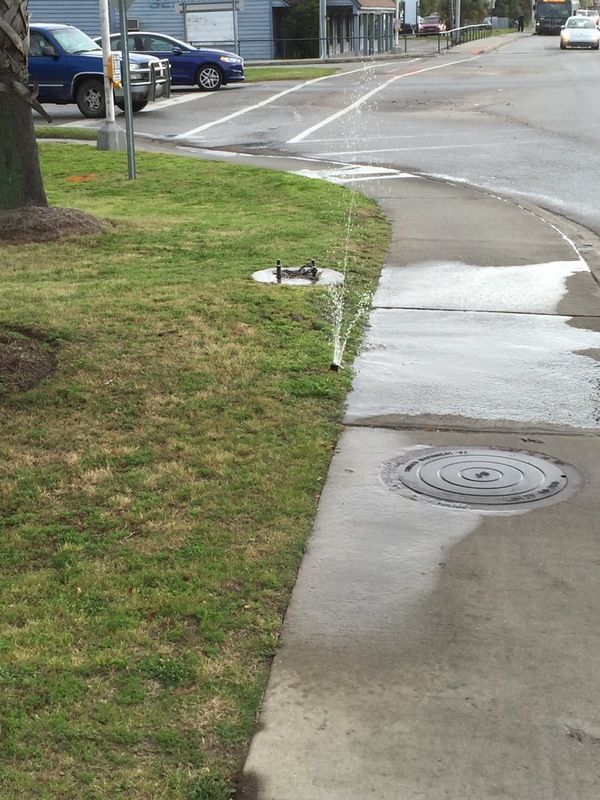 A fountain watering the sidewalk. Maybe hoping it will grow wider? It’s a minor thing, but it symbolizes how much we neglect pedestrians. You see it all the time. Bumpers peeled off automobiles, hubcaps, sideview mirrors, all manner of vehicular debris cleared off the streets by tossing them on the sidewalks, where they sit for months. Cars in my neighborhood, on Magnolia Drive, park right across the sidewalk, forcing joggers and walkers and baby strollers into the street. Crews repairing roads regularly block sidewalks with signs alerting drivers to the construction. Here’s a typical scene, which I found this afternoon when I biked over to the Main Branch of the County Library on Calhoun. The sign reads “Sidewalk Closed.” Why? To provide a parking lot for some sort of cherry picker. I think maybe it was there to work on the windows of the building. Who knows? No workers were in sight. How long would it stay there? Who knows? Whatever the reason, it made the library inaccessible to pedestrians. No one would ever dream of closing a road to do some maintenance on a building. But in Charleston, we close sidewalks in front of the library without a second thought. But we’re headed in the right direction. We’re starting to break the tyranny of the automobile. We’re building neighborhoods that are pleasant to walk through. We’re retro-fitting our 1970s highways. The new bike lane is the most important part of this trend since the Cooper River Bridge was built. It’s the right way to go. 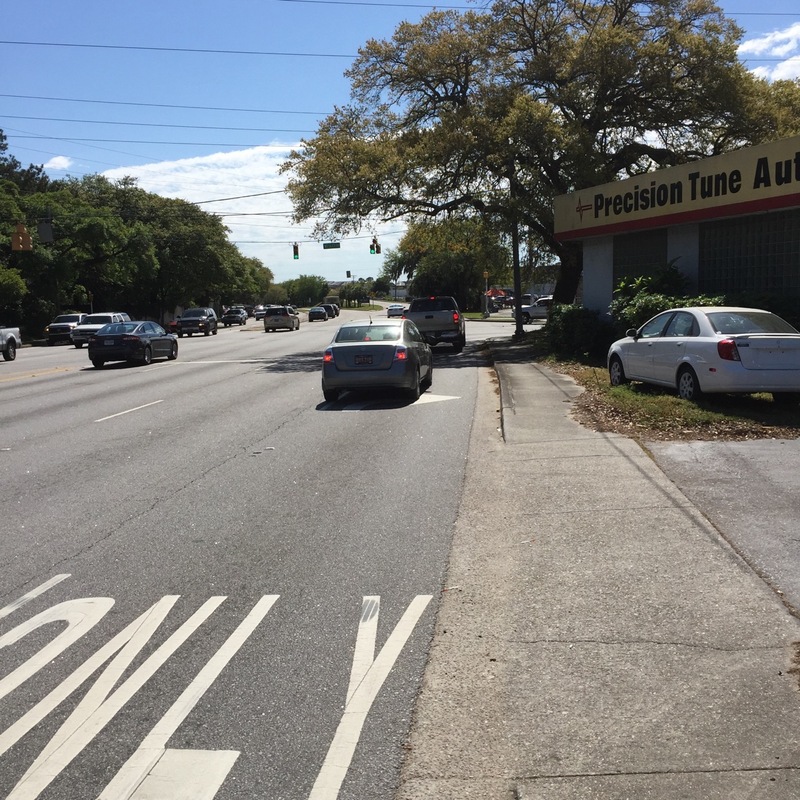 If you walk or bike anywhere in Charleston, you should do something about it. Call your County Councilor. Better yet, come out in person. On this Monday–11 April–at 6pm, Charleston Moves is organizing a rally at City Hall. I hope to see you there.